Obama Still Hasn't Seen The Force Awakens, Can We Really Trust This Man to Run Our Country? “Okay everyone, I’ve gotta get to Star Wars.” These were the words uttered by President Barack Obama at the end of a White House press conference on December 18. And yet, Obama did not see the film. In his post-State of the Union interview with YouTube star Azande “sWooZie” Thorne, it was revealed that on December 18, The Force Awakens was, in fact, screened in Obama’s basement. And yet, Obama did not see the film. The White House, in fact, hosted the screening for members of the military and their families—which Obama called the “most important thing” happening at the White House that day. 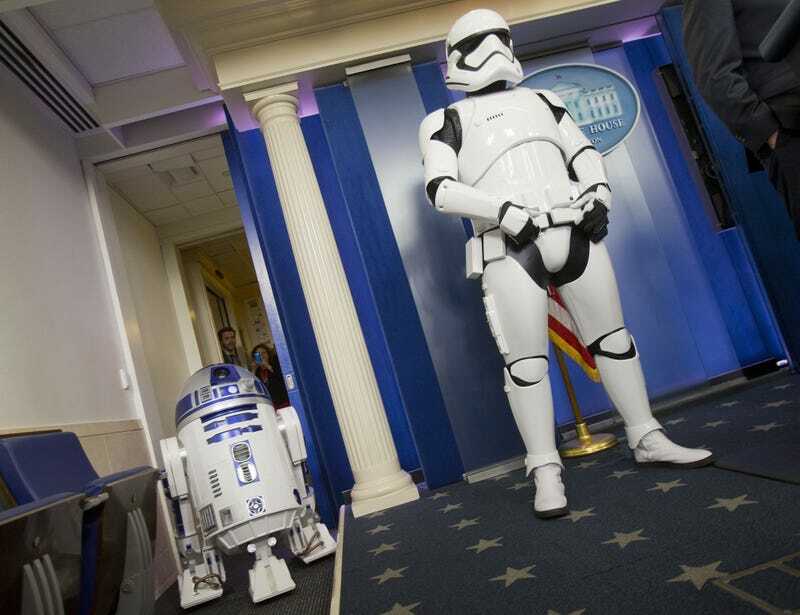 In fact, the president’s press secretary hosted a mock press conference about the film in the White House briefing room with R2-D2 and two Stormtroopers standing on either side of the podium in a way that was not at all creepy. And yes, Obama did not see the film. Not that day. Or the next day. Or any day. One month later, Obama has still not seen the film. You know who has seen it? A real American. Ted Cruz.